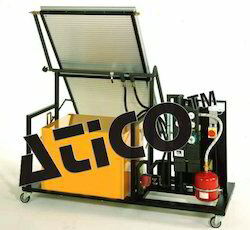 Our range of products include fluidisation and heat transfer, single solar collector system, solar energy demonstration pc, water cooling tower, water to air heat exchanger trainer and jacketed vessel with stirrer & coil. A fluidised bed is formed when a mass of particles is suspended by passing gas through them. The thermodynamic and fluid mechanical properties of the solid take on the character of a fluid. 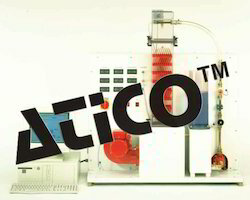 The heat transfer from a heated cylinder to the fluidised bed can be investigated using the benchtop unit. The glass measuring cylinder with background lighting enables the fluid bed and the fluidisation process to be very clearly observed. A heating element that can be lowered into the reactor enables the transfer of heat in the fluidised bed to be investigated. Temperatures are measured with sensors at the air inlet of the reactor, at the surface of the heating element and in the fluidised bed. A safety valve limits the reactor pressure. A supply of compressed air is required. In this system a flat plate collector transmits the radiated heat of the sun to a heat transfer medium. The energy is transferred to a hot water circuit in a heat exchanger. A differential temperature controller with thermostat keeps the hot water temperature in the reservoir constant. The solar circuit is protected with an expansion vessel and a safety valve. This system is built using commercially available components. For adequate performance the system should be operated with direct irradiation by the sun. The is a fully-functional demonstration model of a system for heating domestic water using radiation energy. A high-power lamp simulates natural sunlight. Therefore, the unit can also be used in closed rooms. The light is converted into heat in an absorber and transferred to a heat transfer medium, in this case water. A circulating pump delivers the heat transfer medium through a warm water reservoir. In the reservoir, the heat is transferred to the stored water by a heat exchanger. Additional heat can be dissipated using 2 tap water connections. The unit is equipped with sensors to record temperatures, illumination and flow rate. The measured values are indicated on displays. Using a data acquisition card, they can be transferred to a PC for further processing. Can be used to investigate various angles of incidence and irradiances. To do this, the flat absorber can be set to different angles and the height of the lamp is continuously adjustable. Cooling towers are a special type of counterflow heat exchanger. Warm water is sprayed from the top down through the column while airflows up through the column. Cooling is predominantly due to the evaporation of the water. The amount of water evaporated is measured. A fan supplies a variable cooling airflow. 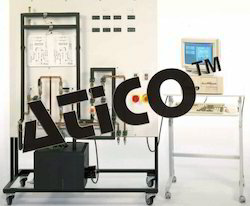 All important process parameters including the water flow rate are measured electronically and displayed. The measured values can be transferred to a PC for analysis and further processing. A data acquisition card and software are included. Four further cooling columns are available as accessories. 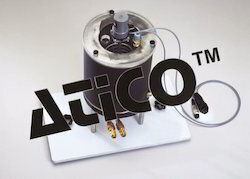 Quantitative investigations on a water -to-air heat exchanger can be performed using this trainer. The trainer consists of a closed hot water circuit with heater, tank, pump and flow meter. Air is forced through the heat exchanger using a radial fan. Water and airflow rate are adjustable. The flow rate of water is measured using an electromagnetic flow sensor and an orifice plate flow meter is used for the airflow measurement. Energy balances can be established by measuring inlet and outlet temperatures. A pressure transducer in the water circuit enables the pump characteristic to be recorded. The measured data can be processed and displayed on a PC using the data acquisition card and software supplied. Batches are heated in jacketed heat exchangers. The heat exchanger contains a stirrer for improved circulation and a further sensor to measure the batch temperature. A heater coil is also included. The transparent cover allows the process to be clearly observed. The heat exchanger is connected. service unit using quick-action hose couplings and star grip screws. The temperature sensors for measuring the feed and return temperature are on the supply connections. 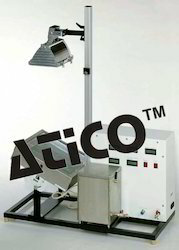 Connections for the additional temperature measuring point and stirrer are provided on the service unit. 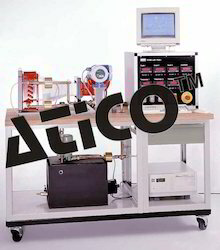 The mobile test stand can be used to demonstrate the fundamentals of heat exchange between tubular flows. The unit is prepared for processing the measured data on a PC. Hot water circuit with pump, tank and tank heater. The water temperature is set on the heater with a thermostat. The cold water is taken from the network supply. Heat exchange takes place in a double-walled pipe. Manual valves permit both parallel and counterflow operation. The cold and hot water flow rates can be adjusted. The flow rate and relevant temperatures are recorded by electronic sensors. A display panel for the measured values is located on the instrument panel next to the copper pipework. The data acquisition card and software are included. 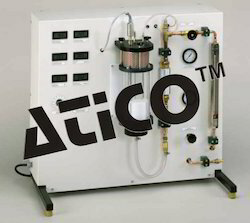 The heat exchanger is connected to the service unit using quick-action hose couplings and secured with star grip screws. The temperature sensors for measuring the feed and return temperature are on the supply connections. The shell of the heat exchanger is made of transparent plastic so that the tubes are fully visible. Shell and tube heat exchangers are typical industrial heat exchangers and are manufactured up to very large sizes. Looking for Applied Thermodynamics ?